I thought I would share the stages that go into making one of my floral pieces. These happened by accident. A happy accident as it were. I decied to challenge myself as I haven’t painted from in a while and wanted to see if I still have the skill. I hadn’t painted with my wrist in a while, you paint from three parts of your arm. Shoulder, elbow and wrist. I have been doing a lot of shoulder action lately with the more abstract work. Throwing paint at the canvas, setting them on fire and repeating. 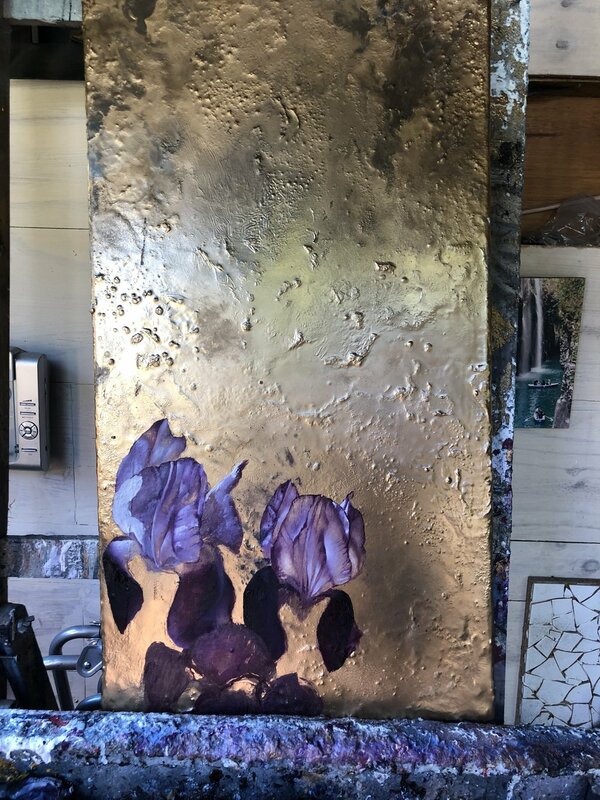 With the flower images I started off with setting them on fire and then painted onto the set canvas. I wanted to challenge myself with something delicate and organic. I had painted an Iris four years ago for my sister I thought I would start with an Iris and see how I fared. I was heavily influenced by Klimt. He was a court painter before he became more expressionistic pre World War 2, his use of metallic paint and his simplistic style of painting flowers became a starting point for me. I started to look at the Orient and their use of line and colour in the silk screen painting. So without hast I went to it and couldn’t stop with just one. The challenge and reintroduction to colours that I hadn’t used ina while was addictive to me. I dont settle for anything less then perfection in a piece I create even if it sends me to bed for days with the pain I get from doing them.